The space consumed by full-assembled ceiling fans might be more than a retailer would wish to provide. 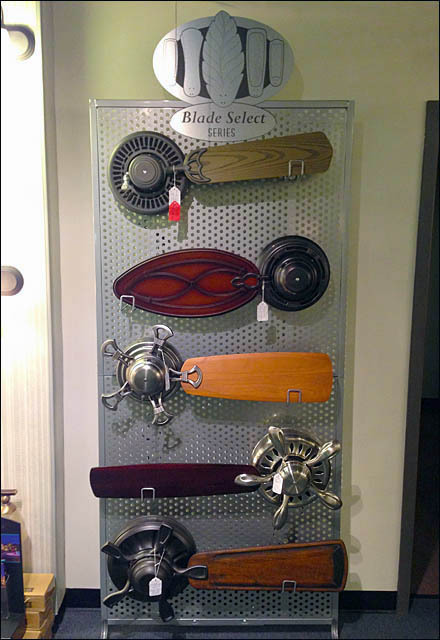 This Ceiling Fans Sold Loop Hook display gives an idea of what each configuration might look like, compared to all others. Square 90 Tip All-Wire Loop Hooks support the various fan blade offerings. A large-hole perforated metal display surface allows flexible placement of the Loop Hooks as well as a face to which to bolt ceiling fan housings. Click through the Ceiling Fans Sold by Loop Hook gallery for a closer look.